If you have hopped over from the Simon Says Stamp blog you are right on track. 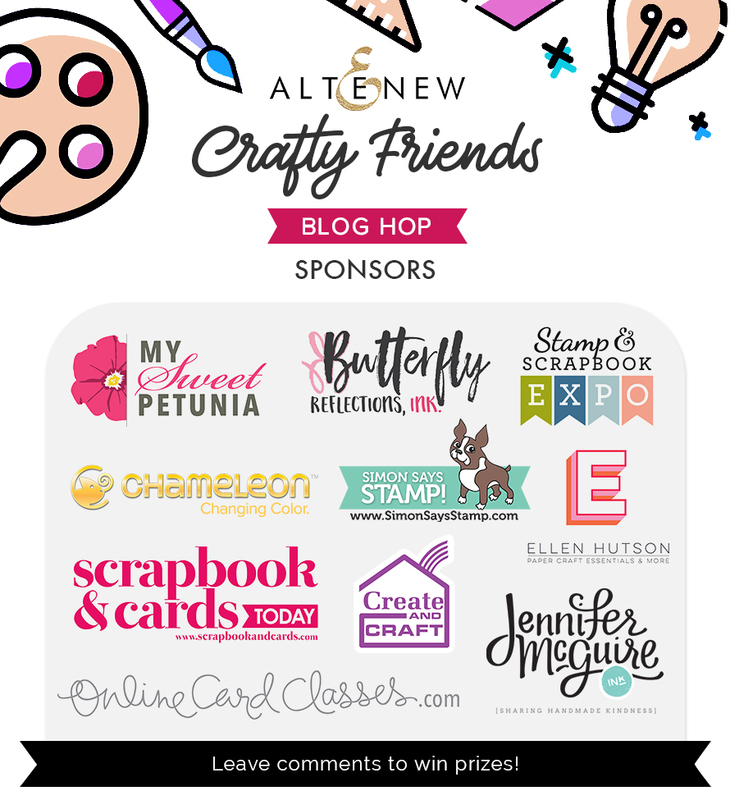 You can start the hop over on the Altenew Card Blog. For today's Hop I decided to share a layout which I started to created on a FB live. 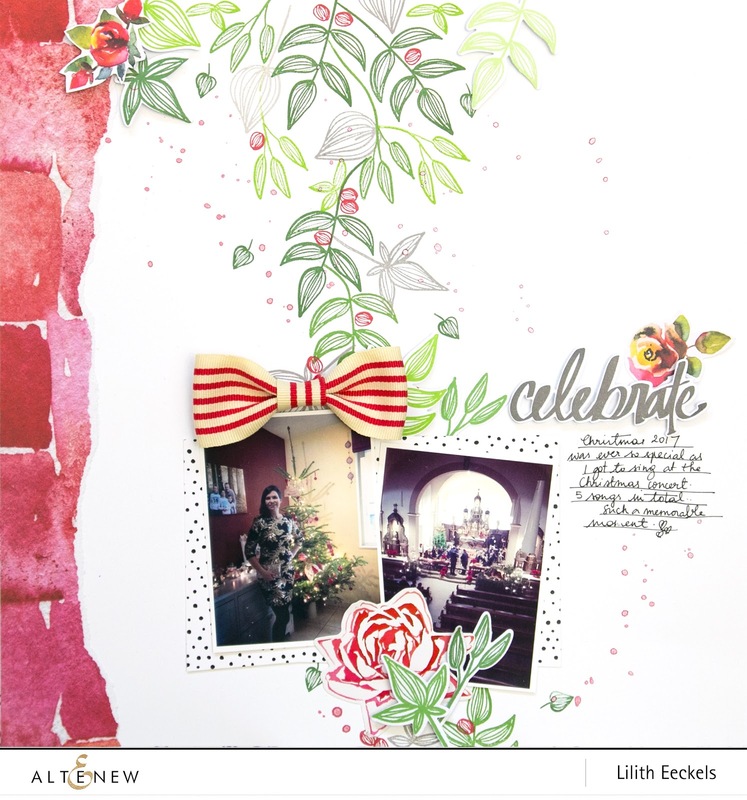 I used the Freeform Greenery Stamp and Die set to create a holiday themed layout. I picked Christmassy colours using the Green Valley Crisp Ink Set and paired it with some Crimson Crisp Ink. A pretty bow, a rose sticker from the Reflection Scrapbook sticker sheet and a couple of inks splatters finish of the layout. It is pretty simple to create a Christmas themed layout with a non Christmas stamp set. I am also giving away a 20$ gift voucher. So leave a comment below. Another amazing layout Lilith. Thanks for the inspiration! What a wonderful blog hop to celebrate this great international crafty community! Beautiful page with the Freeform Greenery. The greens and berries look great and like that you popped the flower and greenery over the pictures. You've made that free form greenery stamp set come alive on this beautiful layout page. Again, all the inspiration from all the sweet crafty friends on this blog hop is amazing. Really nice layout💕 I love the bow addition also. Beautiful layout! you should have included a sound track of the singing! I love seeing your layouts! Always inspiring! Love your beautiful page and the way the leaves are creating a canopy over the pictures. While I don't do a lot of scrapbooking, I do love that I can take design ideas from your posts and get inspiration for making cards. It really is a beautiful layout! Stunning layout The colors and design are beautiul. Thanks for sharing your talent. Great example of how to use stamping and watercolors for memory keeping. Love the cascading effect on the background and the changing of the colors. Very pretty. This looks so delicate. Very nice. Although I don't scrapbook, I appreciate the time and thought that goes into pretty layouts like yours. Thank you for sharing! Very pretty layout. I would scrapbook of I could do it as well as you. Beautiful layout using the stamps with seasonal colors. Terrific use of the white space! Beautiful Layout . . . I LOVE pages that use just a couple pictures to represent the occasion. you have highlighted them beautifully. Wonderful layout. Thanks for sharing. Fun page with the adding stamped images! What a lovely, festive layout! So pretty with the bow! Your layout is just beautiful! What a unique style! I've never seen anything like it and I love it! The greenery just pops and moves. 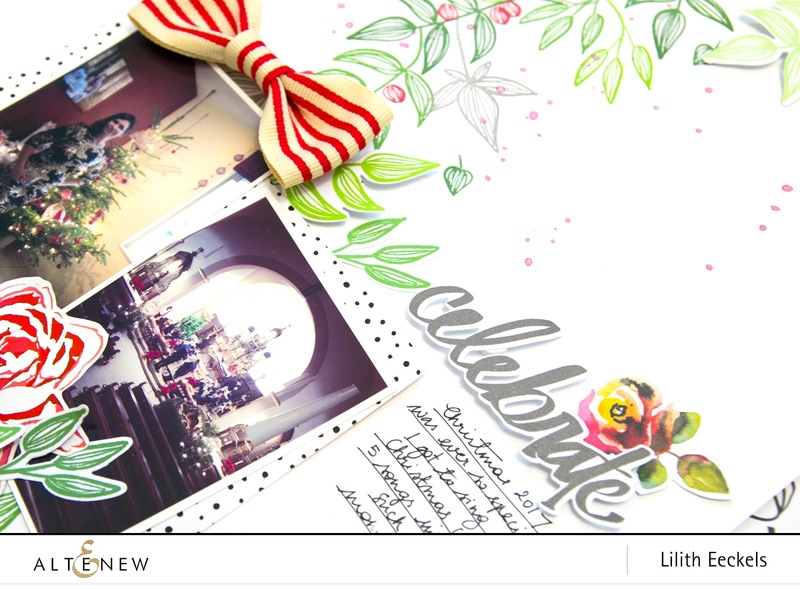 This is such a fun layout, love that bow! Lovely page. I could see Leaf Canopy used here too. Thanks for sharing. So pretty - love your bow added to it! This is just a lovely layout, Lilith!! I love this layout and all your stamping! Makes me want to get all my scrapabooking stuff out and create. Very pretty holiday layout. I like the addition of the bow. I don’t scrapbook but seeing your layout , I can see how it can be done right ! Beautiful page! I like how you used gray ink for some of your leaf images. This is a great layout. I need to use stamps to make a layout. Have never done that. Beautiful Layout. I need to do more scrap booking. Thanks for the chance to win and the great inspiration! Beautiful layout 😍 Scrapbooking is a lot different from where it started. Love the greenery falling across the whole page. what a beautiful concept for a scrapbook or a card. Gorgeous scrapbook layout. I love how the greenery cascades down to meet the candy cane striped bow and the photos. Thanks for sharing your time and talent with us. This is beautiful! Love the stamping and the bow looks really cute. I like your layout very much, thanks for this wonderful inspiration. What a gorgeous way to document a memory! Love this! I love the greenery! Gorgeous layout! So elegant, love your brick along the edge. Showcases your beautiful subjects beautifully!! I love the creativity of this page. All the little added touches just make it such a sweet page. Oh Lilith, what a stunner of a layout! You always do beautiful layouts but I think this has become my fave. Such beautiful leaves and detail and the bow looks so awesome. What a special page....LOVE! Really great and unique layout. Love it!! Really Great and unique layout! Love it. What a beautiful layout! I'm new to crafting, and I am so glad this blog hop brought me to your page. Truly one of the most intricate and beautiful ones I've seen to date. Thank you for the great inspiration! Wonderful layout! Love the stamped greenery and that fun little bow! I struggle with page layouts that I don't have several photos for. This is a lovely page and helps me see how I can scrap for just a photo or two. Beautiful layout. I love the swath of red paint down the side, and fresh colours you used. Very pretty! Lovely layout and design! Very pretty! Love this beautiful layout! It definitely has that holiday feel. What a beautiful layout. I really love the way you cascaded the greenery down to the photo. TFS! Beautiful layout. Love the bow too! Love the greenery. Beautiful layout! It’s not often that you see greenery taking center stage; usually they’re only used to enhance florals! A beautiful layout and background! LOVE the brickwork on the side! Beautiful page layout, I love the colors and the soft cascade of the freeform greenery down the page. Your page designs are always so wonderful! Thank you for sharing your techniques with us, and also your layout is so beautiful! What a lovely scrapbook page. Thank you. such a lovely page, pretty flowers and vines, like how you did the writing! Fabulous layout! I love the beautiful details! 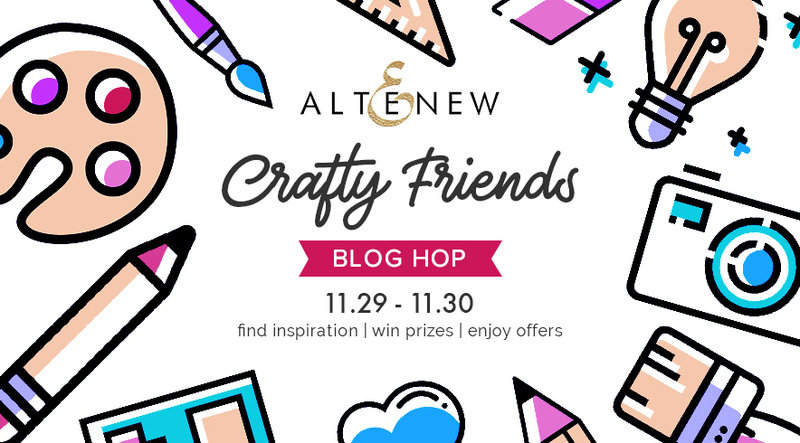 Enjoying the Crafty Friends blog hop! So many fabulous creations! Such a beautiful layout! Love the colors and details! Such a pretty layout! The greenery is beautiful stamped in Christmas colors. You did an amazing job arranging everything on your page. Sweet layout, the design arrangement really enhance the photos. What a pretty card. I love the red brick side border! Thanks for inspiring. What a beautifully creative layout! Love what you did with the greenery--simply FAB! TFS--have a blessed weekend. Your layouts are always beautiful! That stamp set looks fantastic! I need to check out your FB page to watch you make it. Nice layout and festive feel. Looks like a fun card to make. Wow - this layout it awesome! I have this stamp set, and have never thought of using it for christmas greenery. I really need to get out of my box(es), lol! Great scrapbook page. Very inspiring. Thank you for some great ideas! What a gorgeous and delicate layout! You managed to fill this space so beautifully - I am too scared to work with such a big format! Thank you for the lovely inspiration! Gorgeous layout--the stamping is awesome and I love the cute bow! What a well laid out layout! That may not roll off the tongue, but it's true! I love the way the eye flows!! What a beautiful layout! I'm new to crafting, and I am so glad this blog hop brought me to your page. My best friend has introduced me to arts and crafts. Thank you for the great inspiration! By the way, Merry Christmas and I hope everyone has a good holiday!! I love your LO and how the leaves travel from the top to the bottom, with your photos within that line.its gorgeous! I lvoe seeing layouts! They give me such inspiration! A beautiful page with a gorgeous lay out. Love the colours you used and the lovely bow as finishing touch. Thank you do much for sharing. 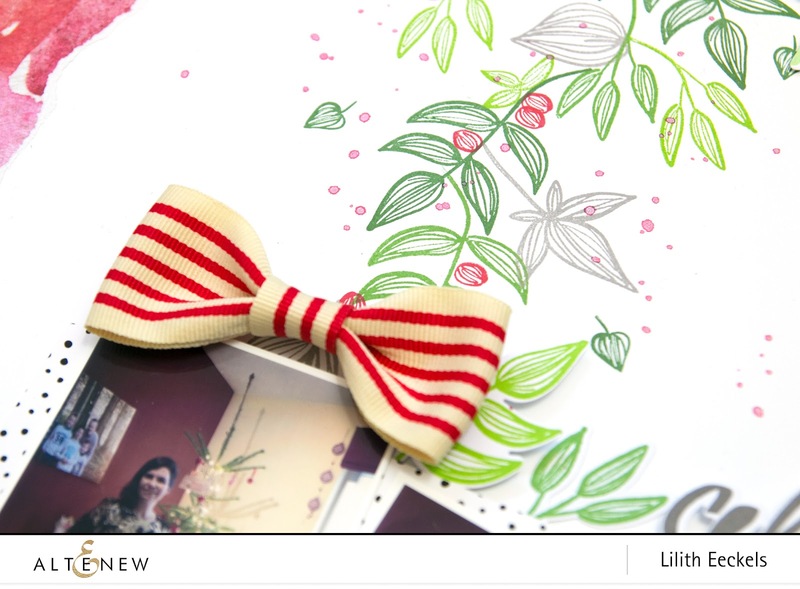 beautiful layout, Lilith - the red stripe bow is the perfect touch! I love your layout, especially the bow! It reminds me of a candy cane. Beautiful layout! I really like the red on the left. Reminds me of bricks. A beautiful layout! The greenery added to the photo's on the page. A special page for a special memory. Great layout!! Love the greenery stamp and the bows. Outstanding!! What a fabulous way to make a Christmas look out of non-Christmas sets. I particularly love the almost peppermint striped flowers. Not I look I would think to go for, but I really like it. Thanks for sharing your creativity with us! Beautiful layout. Thank you for the inspiration! What a beautiful scrapbook page! Love seeing all of the wonderful ways that crafters incorporate stamping...and hoping to start crafting more now that my kids are older! Thanks so much for sharing your talent & inspiring all of us! Nice layout, love the addition of bow. really pretty page. great colors and layout. This is fabulous! I love all the details you added to this beautiful layout. Thanks for the inspiration. Beautiful design! I love the leaves and the bow!! Very eye-catching layout! I like the bricks you put going down the side mixed with the vines...reminds me of my alma mater’s 😊 campus. Such a lovely mix of colors on the gorgeous layout.Thanks for sharing this inspiration with these fun products. Lovely layout! Wonderful job; Thanks for sharing!